The Chinese Academy of Sciences (CAS) honored UCAS Senior Advisor Shih Choon Fong and other two foreign scientists for their contribution to facilitating international cooperation in science and technology in Beijing on Jan. 17th. 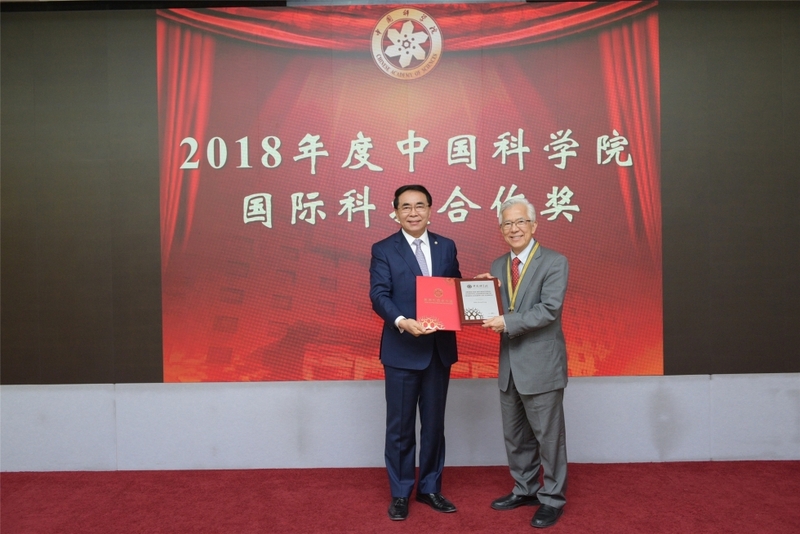 The University of Chinese Academy of Sciences (UCAS) was also commended as Prof. Shih’s endorser at the ceremony. Shih Choon Fong is a world-famous academic leader, educator and a renowned fracture mechanics expert. He is a former president of the National University of Singapore and the Founding President of King Abdullah University of Science and Technology. He is currently University Professor at the National University of Singapore. Shih was elected as a Foreign Honorary Member of the American Academy of Arts and Science, US National Academy of Engineering, and serves as chairman of the Singapore-Massachusetts Institute of Technology Alliance governing board. He was awarded the French decoration "Chevalier" in the Order of the "Legion d'Honneur" in 2005 and received the Centennial Medal from the Harvard Graduate School of Arts and Sciences (GSAS) in 2018. Shih has made pioneering achievements in non-linear fracture mechanics, fracture analysis and contributed greatly to the development of physics, materials and other relating disciplines. Shih uses his international influence to promote the educational internationalization of the University of Chinese Academy of Sciences. Thanks to his active coordination, many UCAS undergraduates have been given opportunities to study in the world's leading universities such as MIT and Oxford for up to half-year. He also initiated UCAS’ Overseas Graduate Studies Fellowship Program, which recommends outstanding undergraduates from UCAS to pursue PhD studies in the world's leading universities. Shih has been actively promoting CAS’s industry-university-research institute development and has devoted much effort to launching and developing the UCAS’s Innovation and Technology Transfer Center. He has visited many CAS institutes and made speeches on innovation and entrepreneurship education as well as technology transfer. He has been vigorously championing a CAS-led Liquid Sunshine International Coalition to offer green energy solutions. The coalition has the support of some of the world’s top universities and enterprises, thereby opening a new chapter for CAS in leading the development of the global green innovation industry. As of now, Shih Choon Fong is the first UCAS candidate to be confered the Award of International Scientific Cooperation of Chinese Academy of Sciences (CAS-AISC). Launched in 2007, CAS-AISC is conferred to foreign experts who has made outstanding contribution to build long-term strategic partnerships between foreign scientific institutions with CAS; to enhance CAS’s competence in addressing key issues in science, technology and management by introducing innovative ideas, technology or methodology; or to upgrade the level of research, innovation and management of CAS by training innovative talents or introducing high-grade scientists to CAS. To date, 34 foreign scientists have received the award. Many of the honorees also won the International Scientific and Technological Cooperation Award of P.R.C or the Chinese governments’ Friendship Award.